Did you know that 76% of GPs regularly refer patients to massage therapists? Massage & Myotherapy Australia has developed a member support program to help drive clients to our members through local GPs. GPs in your area now carry Massage & Myotherapy Australia brochures promoting the value and benefits of massage and myotherapy. If just 10% of patients who visit your local doctor for musculoskeletal or conditions involving hypertension take a brochure and contact a local massage therapist, that equates to around 120 potential new clients from each GP in your local area each year. By getting involved, it’s a tonic for your business that you can use to expand your client base. 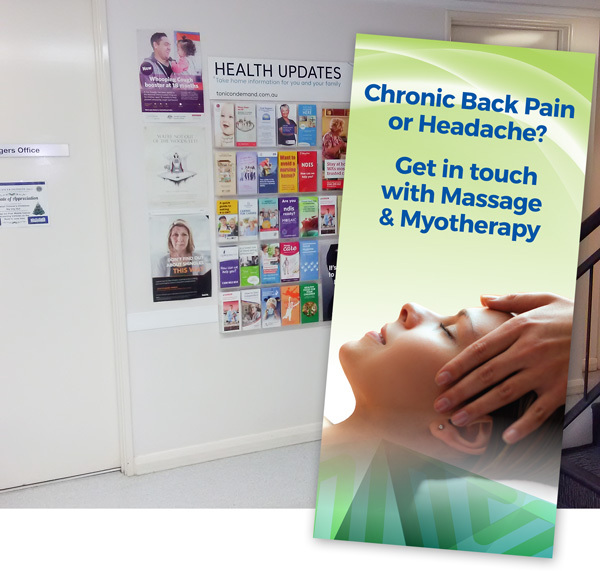 Purchase copies of the ‘GP Massage Brochures’ from Massage & Myotherapy Australia, display them in your clinic, and use the brochure to link your services to the brochures displayed in GP clinics. Each brochure also includes space to enter your details. If you wish, offer specials for first time clients, or offer discounts for existing clients who refer a friend. You can also ask your local libraries, community centres, aged care facilities and so on, to display your brochures. The ‘GP Brochure‘ program provides an easy low cost way of giving your business a promotions tonic. Remember do not contact your local GPs as they should have received the massage brochures already. To find out more or order your brochures, contact Massage & Myotherapy Australia on info@massagemyotherapy.com.au. Login into the members section of website for more information here.